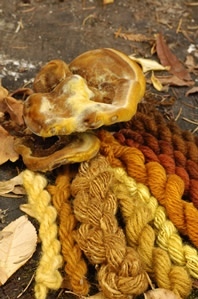 It was while artist Miriam C. Rice was teaching a children’s art class about natural dyes at the Mendocino Art Center, in Mendocino, California, that she took a clump of bright yellow Hypholoma fasciculare mushrooms, and tossed them into a dye pot of simmering hot water with a bit of wool yarn. Fortunately, for all of us, a clear bright lemon-yellow dye emerged on the wool, and voilá! "mushroom dyeing" was born! The early 1970s were very rainy years in Northern California, and Miriam experimented with every mushroom she found for dye potential. 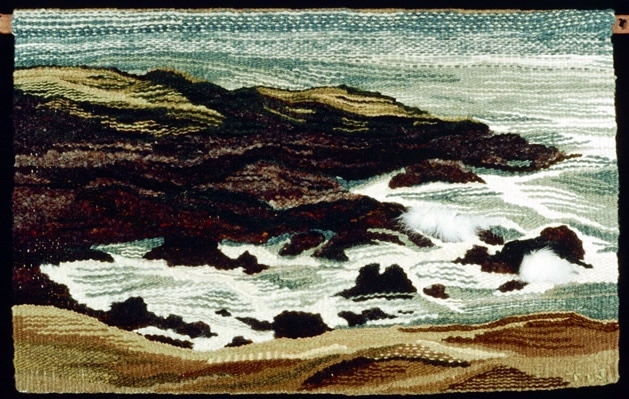 Many of the fiber artists in the Mendocino area were intrigued with the possibilities revealed in her experimenting, continually providing Miriam with new mushrooms to try for color. She attended mushroom fairs and forays, learning to identify the mushrooms she was using in her dye experiments, and over a period of several years, gradually built up a vast collection of labeled samples of mushroom dyed wool, silk and cotton. The mushroom dye process is basically the same as for all natural dyes. The fungi are chopped up or mashed, added to water simmered in a non-reactive pot such as enamel or stainless steel. Usually a proportion of 1:1 ratio of mushroom to fiber is added to the dyepot and gently simmered for a specified length of time, ½ to 1 hour, or until a desired depth of color is achieved in the fibers. Protein fibers, such as wool, silk, mohair, angora, etc, most readily accept the dyes, though cotton, linen, hemp and some synthetic fibers may be successfully used. For a mushroom to produce a dye, it must contain a water soluble pigment that will be resistant to sun and washing. Many mushrooms contain pigments which will make a good lightfast and colorfast dye without the use of a mordant. These are called "substantive dyes". However light and color fastness is improved by pre-treating the fiber with a "mordant". Mordants (metallic salts) are simmered in a hot water bath to enable molecular bonding with the fiber. In a subsequent dyebath, the mushroom pigment in turn bonds with the mordant on the fiber, enabling the pigment molecules to make a stronger bond than they would without a mordant, and therefore increasing the potential for light-fastness and color-fastness. A mordant also has the potential of changing the original dye color. Miriam Rice originally used 5 different mordants in her mushroom dye experiments: potassium aluminum sulfate, potassium dichromate, stannous chloride, copper sulfate, and iron sulfate. She developed a knotting system for differentiating different mordanted yarns, which is now in universal use among mushroom dyers, enabling them to keep track of which mordanted yarns produce which colors. However after many years of research, Miriam decided that alum and iron are the only two “safe” mordants that should be used. She still retained the same knotting system – with 1 knot for alum mordant and 5 knots for iron mordant, reminding dyers that the missing knots are for those mordants that she considered unsafe to use. Cream of tartar and Glauber salts are often used with mordants to help in distributing the dye evenly in the fiber. Other additives can be added to the dye baths to enhance and alter the color hues by changing the acidity (pH value of the dyebath). Miriam preferred white vinegar to change the pH of a mushroom dye toward acidic, or washing soda to nudge it toward alkaline. Encouraged by textile artists in Mendocino in the 1970s, who were thrilled with this new source of color for their fiber arts, Miriam wrote the little book, "Let’s Try Mushrooms for Color" which was published by Thresh Publications, Santa Rosa, CA in late 1974. This was the first book known in the world about the use of mushroom dyes, and these groundbreaking ideas soon quickly spread to international fiber artists searching for a new source of natural dye pigments. The first successful mushroom dyes were in the range of what one would call "earth hues", yellow, gold, orange, burnt sienna, brown and every shade in between (as exemplified by the dyes from Phaeolus schweinitzii). A breakthrough into a new range of color came under the guise of a little brown mushroom which yielded rose, red and burgundy hues, depending on which mordants used. It was by "keyed out" (by mycologists at the University of Washington) as belonging to the Cortinarius family. Many of the species in this group contain extremely lightfast anthraquinone pigments, especially red. Continuing experimentation produced lovely purple, blue and green hues from other mushrooms, continuing to enchant and inspire textile artists world wide, and this expanded palette of extraordinary dye color evolved into a new book documenting the expanded research by Miriam. "Mushrooms for Color" was published in 1980 by Mad River Press, Eureka, California. A chapter on the dye chemistry of the mushroom pigments by Dr. Erik Sundström from Sweden was added in a later printing. 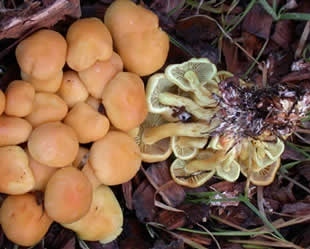 Generally, Miriam preferred to use fresh fungi for dyes, but dried, or fresh-frozen, and with some mushrooms, old species (sometimes bordering on "rotten"), often produced the best color. Freezing causes chemical changes — red dyes tend more toward blue tone. Quality of water used will change the dye if chlorine, acid, alkaline or heavy minerals are present. We use a weight ratio of 1:1 of mushrooms to fiber to begin — some fungi have a lot of pigment, some have very little, so with experimentation, careful observation and note-taking, one can decide the best proportions on a case-by-case basis. 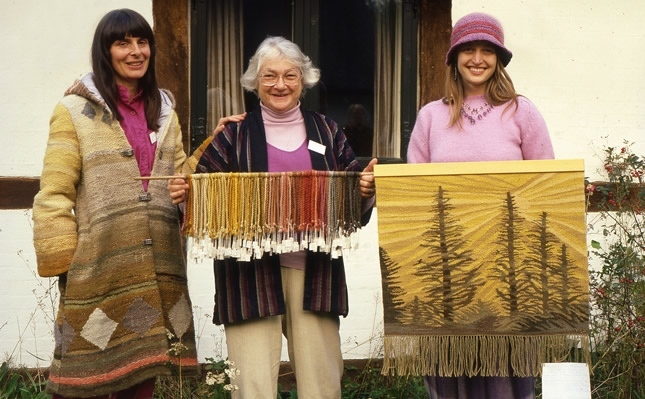 In Summer 1980, the "1st International Mushroom Dyes Textile Show - FUNGI and FIBERS" was held in Mendocino, California. Interest in mushroom dyes continued to spread world wide rapidly due to Miriam’s books, especially in the Scandinavian countries. Soon, books by other authors appeared about the mushroom dyes of Sweden, Denmark, and Norway, encouraging the continued International Fungi & Fiber Symposia over the ensuing years in those countries, as well as Finland, Scotland, Western Australia, Spain, and most recently in Estonia in 2014. The next Symposium will be hosted by British Columbia, Canada, in 2016! 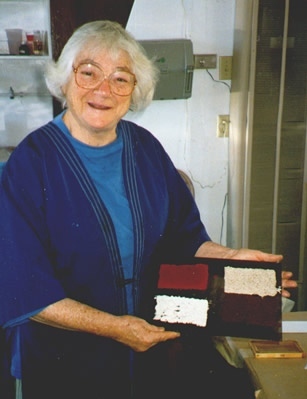 The International Mushroom Dye Institute (IMDI) was established by Miriam C. Rice in 1985. The non-profit research institute was founded to encourage the use of fungal pigments, to further research on their extraction and employment; to encourage research on cultivation of especially desirable fungi; and to financially aid artists and researchers to participate in the international mushroom dye symposia and exhibitions, and it continues its activity, currently hosting the informative website www.mushroomsforcolor.com. While continuing her exploration with mushroom dye pigments, Miriam explored the possibility of making paper out of the fungal detritus leftover from the dyes. Always a passionate advocate of recycling, she saw this as the natural solution for disposal of the fungal residue from the dye process. She experimented with a few mushrooms and polypores, finding that the polypores or shelf fungi which contain chitin as well as cellulose, produced the best paper — all colors, textures and with nothing added. But the fever of the dye experiments prevailed over all until 1985, when she introduced the concept of paper-making from fungi in Denmark at the 3rd International Fungi and Fiber Symposium. In 1992, the exhibit "Let’s Try Polypores for Paper" in Mendocino, CA, caught world-wide attention and another new art form using mushrooms was officially launched! Miriam continued her experimentation into another direction: making watercolor paints from many of the mushrooms she had also used for dye. 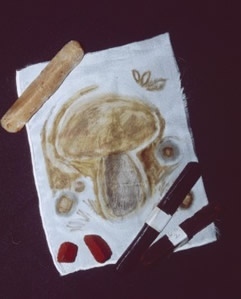 Extracting the fungal pigment and combining them with a variety of media, the results of her experiments were introduced in a 1999 workshop at the 9th International Fungi/Fiber Symposium in Hønefoss, Norway. For some time, Miriam had been thinking of using the mushroom pigments in some other form of medium for artists to use in drawing and sketching to supplement the mushroom watercolor paints. Months of experiments resulted in a drawing medium she called "Myco-Stix™", using pigments extracted from fungi combined with a variety of binders to form crayons which can be used as drawing, watercolor, pastel and encaustic media. "Myco-Stix™" were formally introduced to the world in August 2001 at the 10th International Fungi/Fiber Symposium in Rovaniemi, Finland. 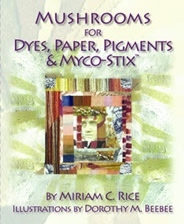 Miriam’s third book, "Mushrooms for Dyes, Paper, Pigments and Myco-Stix™", summarizing her 40 years worth of work with fungal dyes, pigments, and paper, was published by Mushrooms for Color Press in December 2007 and is currently published by The International Mushroom Dye Institute, Fort Bragg, CA. Thanks to Miriam’s innovative research and experimentation, the extraordinary arts of Mushroom Dyes and pigments with all of their related possibilities are now being used and taught by fiber artists world wide, and have been constantly referenced by other authors in new mushroom books over recent year. Sadly Miriam passed away in 2010, but not before she had presented many, many mushroom dye workshops and lectures all over the USA, Canada, and at International Fungi & Fibre Symposia in Sweden, Norway, Scotland, Denmark, and Finland, inspiring many fiber artists worldwide. Her spirit and enthusiasm continues to live on as each new generation now explores this amazing new world of mushrooms for color!